Posted by Maria Perilli on June 27, 2014. High five, you’re alive! Somehow, you managed to survive the stress-inducing powers of 3,000 unread emails, micro-managers that put Bill Lumbergh to shame and counting down the minutes to this very moment. While we’re fairly certain that broaching the subject of productivity on Friday is a cardinal sin, we’re sure you’ll want to start using the latest, coolest, user-friendliest tools featured in our weekly digests right now. Or Monday. Anyway, paired with a sweet digital high five from us to you, we pretty much figured it’ll be impossible not to love these nifty tools that are (literally) virtually guaranteed to grease your productivity wheels (and we give THE BEST high fives. Seriously. Ask around.). Dollar Photo Club: $1 royalty free stock photos and vectors. Memberships start at $10/month for 10 high-res images. Perfect for small-scale budgets and projects. 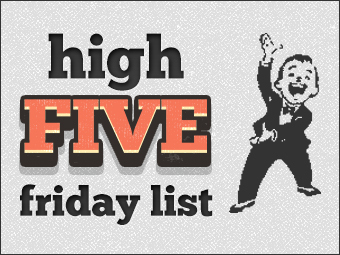 That about wraps it up for our first High FIVE Friday List! We bet you’re already feeling way more productive. We suggest you bookmark this post to revisit Monday. Comment and let us know which tools improved your productivity so much, you can now spend Fridays daydreaming of next week’s post.